Black + Bleu burger is something I’ve seen on 100s of menus. Since I haven’t eaten meat in 2 decades, I’ve never had one but always wondered what is that?! Well, its pretty simple - blackened burger + blue cheese. I wanted to create a vegan version of this dish, but I couldn’t stop there. I also have been wanting to make a dank as heck cajun-style black bean + rice burger. So, here you have my version of the Cajun Black + Bleu - a shoutout to the Creole food with no harm to the animal kingdom. The veggie burger, like always, has a full no crumble guarantee and won’t be too sticky that it will stick to the pan when you grill it. The key to a great vegan burger to me is a perfect combination of what and dry. I call it the hand test. If the patty really sticks to your hand as your form it, way too wet - add flour, breadcrumbs, or other dry ingredients. If the patty doesn’t stick at all, its too dry - add broth, water, or other wet ingredients. 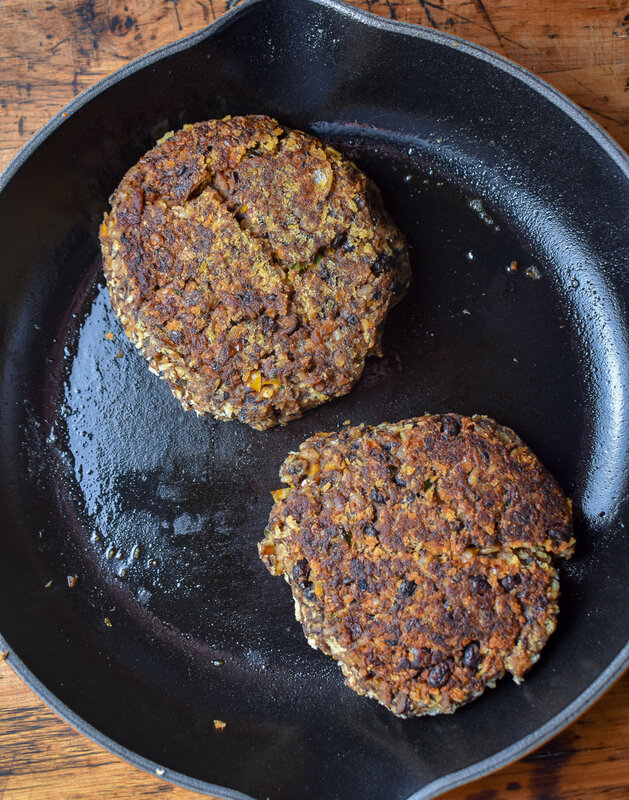 We blend in a pretty typical black bean burger with an awesome cajun spice blend that takes this normal black bean + rice burger to the bayou and back. Its delightful. One of my favorite parts of this burger is we used vegan mayo in the burger. It gives it a great tang and fattiness that a lot of vegan burgers lack. From there, we top it with two amazing accents - an out of this world vegan bleu cheese sauce that is really great. We use small tofu crumbles to achieve that crumbly bleu cheese texture. And, we also add some bacon - shiitake mushroom bacon. I’m known for rice paper bacon, but I like a number of different kinds. Shiitake bacon is going to be smaller and a little less crispy. Its perfect for this burger! 1. After rice is brought to a boil, reduce to low simmer, cover, and let sit for 25-30 minutes. I want it to be a bit chewy still. 2. While the rice cooks, stir together your cajun spice blend in a small bowl. 3. Next, add olive oil, onion, and garlic to a large frying pan and cook over medium heat for 3-4 minutes. Mix in the cajun spice blend + orange peppers. Cook another 3-4 minutes. 4. While the rice steams and peppers cook, mix the shiitake mushroom pieces with all the ingredients for the bacon and add to a baking sheet lined with parchment paper or silpat. Bake at 400F for 20-25 minutes until nice and crispy. 5. While the bacon cooks and waiting on the rice, mix together all the ingredients for the sauce. For the tofu, you want to crumble it with your fingers to get some smaller, medium, and large crumbles. 6. 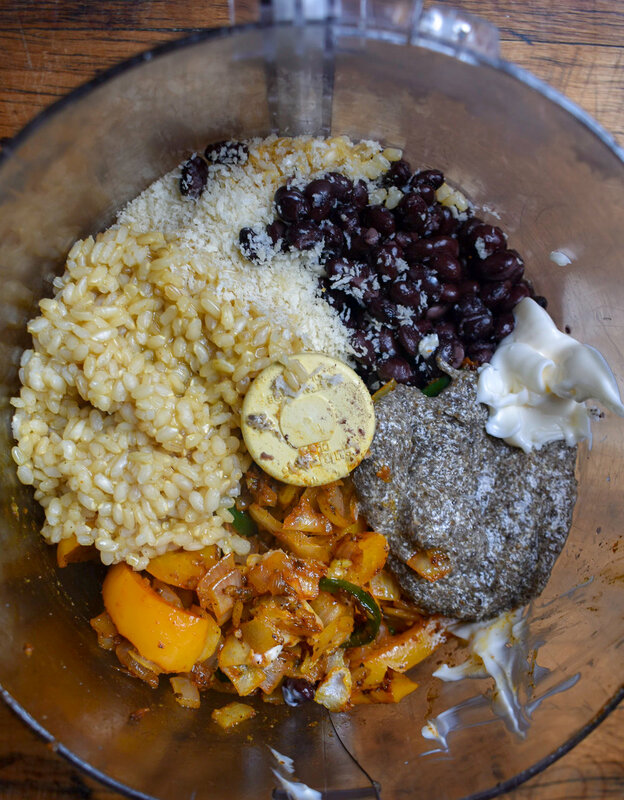 Once the rice is done, add the rice, black beans (reserve 1/2 cup from the cans), breadcrumbs, pepper/onion mixture, mayo, flax egg, and all other patty ingredients to a food processor (you can also mix in a bowl by hand or with spoon). Pulse 10-12 times to mix. I like to leave it chunky. Pour in reserved 1/2 cup of black beans and mix in with a spoon. 7. Form the mixture into large patties - about 5. use your hands to scoop out 1/5 of the mixture. I like to add a bit of extra breadcrumbs to the top and bottom of the patty as I am forming it to help it stick together even better. 8. Using a large frying pan, add a bit of vegan butter or olive oil to coat the bottoom of the pan. In 2 batches, cook the patties. I like to cook them at just over medium heat for about 4-5 minutes on each side until golden and browning. 9. To put it all together, serve a toasted bun, with a layer of romaine, then the patty, add avocado slices, pour on the blue cheese sauce, and top with shiitake bacon. Serve!